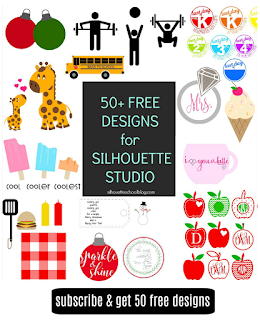 I get asked a lot how I continue to write Silhouette CAMEO tutorials every.single.day two and a half years in. 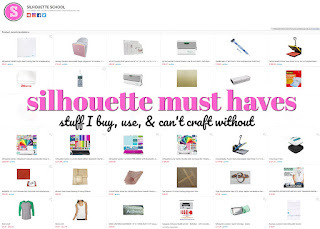 It's actually easy when there are always awesome new products to pair with Silhouette and things to learn. Such is the case with Deco Foil and foam adhesive from Therm-o-Web...I love this stuff so much I'm giving a whole bunch of it away so read on, people. Read on! Certain elements of this design I wanted to cover in foil, but I do not have a laser printer which is necessary to pick up most foils, However, the DecoFoil foam adhesive is a great substitute especially since it can be cut with Silhouette. The first thing you want to do after you have your design is select the elements that you want foiled. 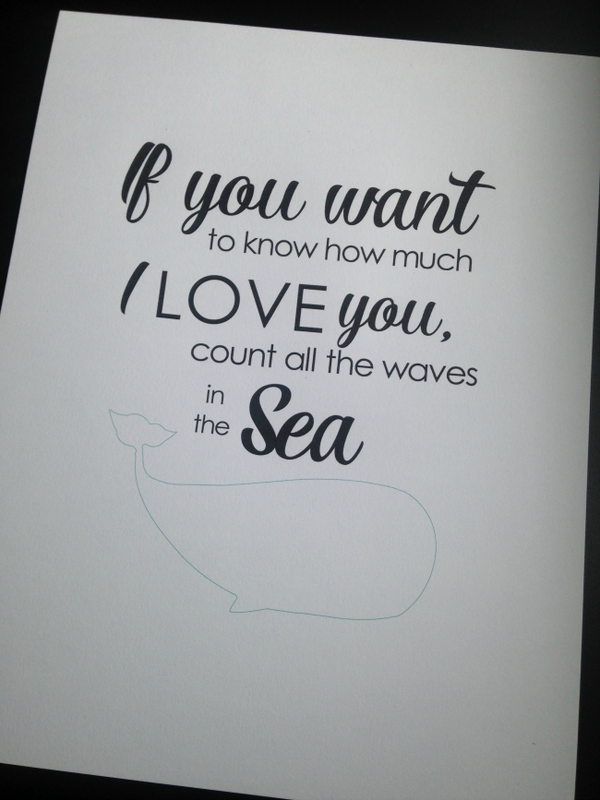 In this case, it's the O and the whale. 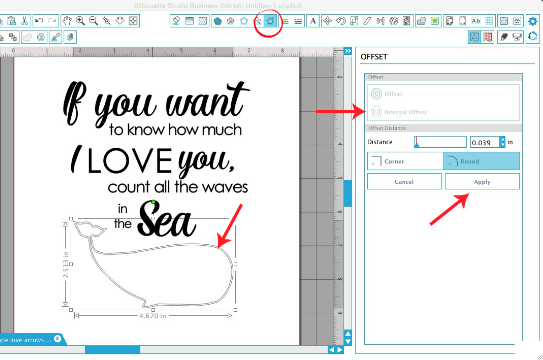 Use the offset tool to create an internal offset of those elements. Move the original piece to the side. Don't delete it, you'll need to cut it. 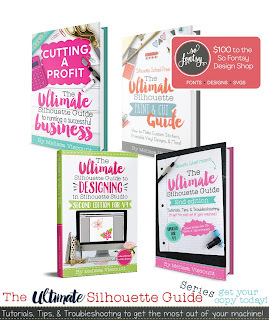 The internal offset you've just created is basically going to be your guide for where to place the foil so it's correctly aligned with the rest of your design. Select the offset, give it a line color and then go into the Line Style tool and give that line a weight of about .3. 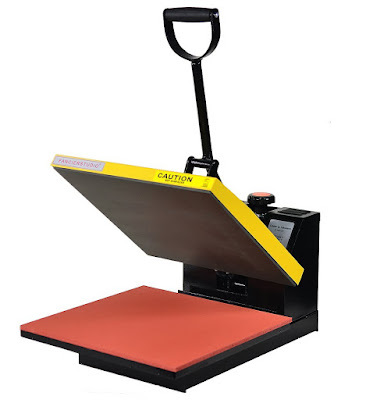 This will ensure the line prints. 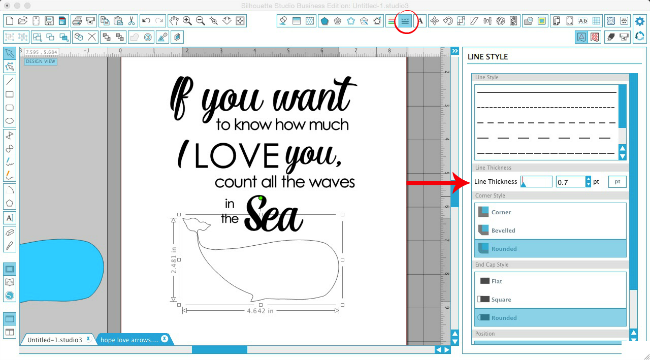 Now print your design on your printer using the Print tool from the top tool bar. I have an HP PhotoSmart 5520 and it never disappoints! 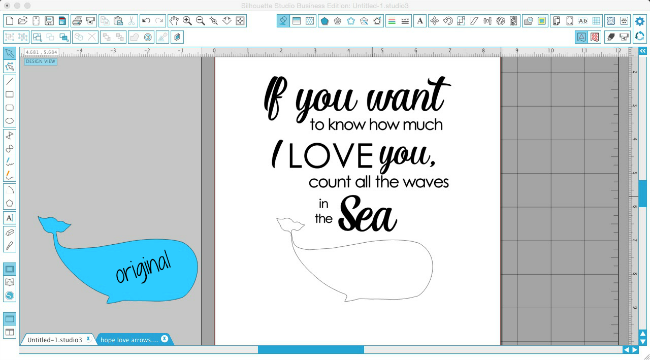 Set your printable aside for right now, as we work on the foil elements. 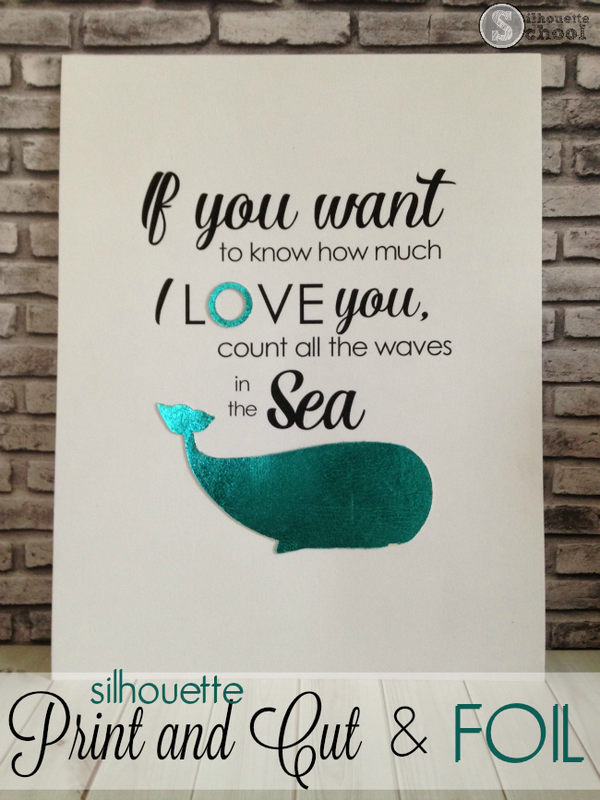 Go back into Silhouette Studio and grab the original design elements to be foiled - again the O and the whale. You don't want the internal offset line, you want the original. Bring them onto a blank work area and mirror them by right clicking > flip horizontally. Now grab your Deco Foil Foam Adhesive sheet and place it with the paper liner side onto the mat. The foam is between two sheets, but the liner side is the one that's kind of hanging over the edge a little bit. You may need to tape the foam adhesive onto your mat to keep it secure while you're cutting. You'll also need a Silhouette Deep Cut blade. Set the blade to 17 and lock it into your Silhouette CAMEO or Portrait. 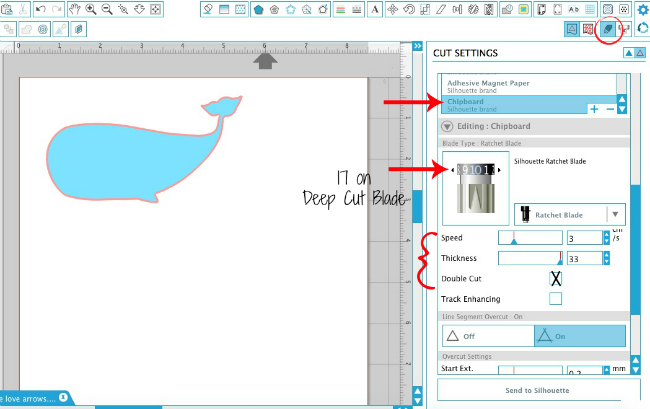 If you're new to the Deep Cut Blade check out this Silhouette beginner tutorial. In Studio select "chipboard" or another thick material from the material list. 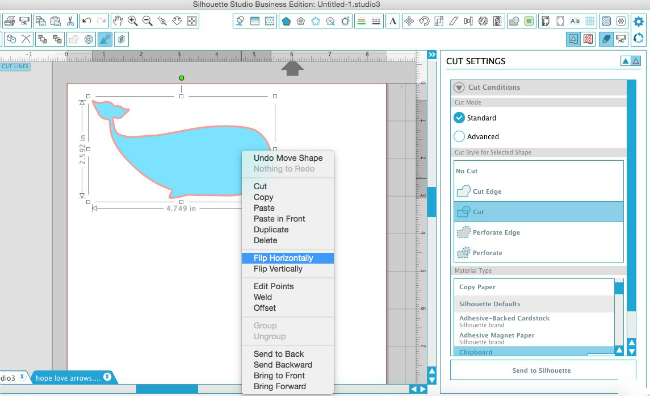 Adjust the cut settings so the thickness is 33, speed 3 and check the box to double cut. I would suggest a test cut...when you're ready Send to Cut. Once the foam adhesive is cut you should be able to peel the design off. If you have a kiss cut that's great, if you cut all the way through, that's fine too. However it cut, just peel the design up and remove the paper backing if it's still on there. Flip a DecoFoil foil sheet over so the silver side is facing up. Then flip the foam adhesive design you just cut out onto it. Press down firmly, but gently. Flip the whole thing over and rub smoothly and gently from the top of the foil. Peel the foil up off the foam adhesive....which should now be covered with foil. On the back side of the foam, you can peel the other piece of paper off to remove the second adhesive side. Place the foiled foam directly onto your printable, using that internal offset line that printed as a guide. We did it as an internal offset, so it would be completely covered by the foiled design. I love the dimension the foam adhesive gives the Deco Foil, too! 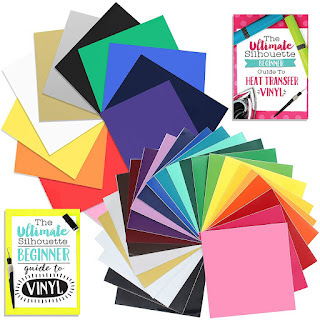 You can also use this same foil sheets on fabric by cutting the Hot Melt Adhesive instead of the foam adhesive and then applying the foil on top of the hot melt and setting with heat! And now for what you've all been waiting for....a chance to get a whole prize pack of DecoFoil products in your hot little hands!! I've teamed up with Therm O Web to give one lucky Silhouette School reader a whole pack of DecoFoil goodies including 1 pack of Deco Foil Foam Adhesive, 1 pack of Deco Foil Peel n' Stick Toner Sheets, 1 Deco Foil Adhesive Pen, 2 Deco Foil Designer Stencils (winner can chose) and 5 tubes of Deco Foil Transfer Sheets (winner can chose their colors). I mean....I wish I could enter!! Can you put foil on wood? I haven't been successful with it and the company said it probably won't work. Though I'm not sure if you could do it with an adhesive pen of some sort if you are writing/drawing. :( Trying other foils. Love the foiling!! So many ideas! What cut settings did you use to cut the hot melt adhesive? 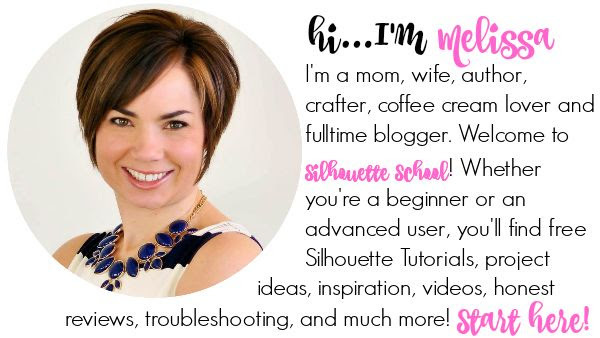 Can you please do a tutorial on using the hot melt adhesive and foil on fabric? I cannot get my cut settings right to cut it. Thanks so much! Can you do a video? When you press the adhesive foam to the foil, do you cut around the foil? Run it through the machine? Or the foil tears away from the shape. Real newbie here. I've used your tutorials and books and really appreciate them. 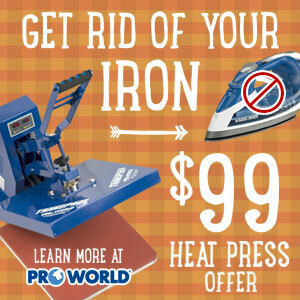 I'm just missing the step between pressing to the foil and finished shape. Thank you! This is awesome! I love seeing more ideas and possibilities of using Curio and DecoFoil is fabulous craft supplies! THANK YOU!